The clock is ticking on our latest free prize draw! 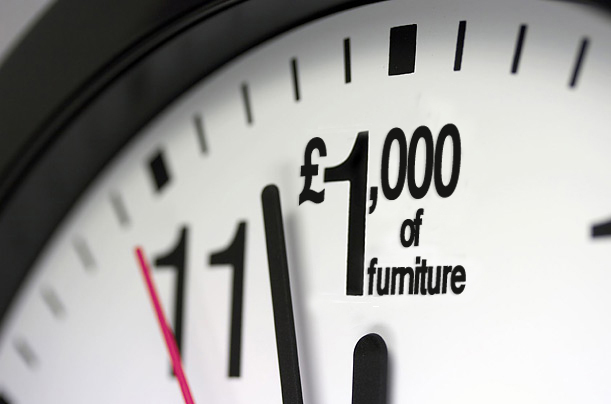 Don't miss you chance to win £1000 worth of new furniture from Furniture123, the UK's leading online furniture and bed store. How would you like the chance to update your home furniture in any way you choose? Would you splash out on a huge new bed and mattress? Or revamp your dining room furniture? Hurry, the draw closes on Wednesday 31st October 2012! Good luck! Pin It Now! The Furniture123 blog is just one way we aim to communicate what is new on our website and in our online furniture store, to you, our customers and partners. New products and furniture innovations, updates to our website and store, upcoming promotions and sales, newsletters and furniture related press releases, and much more information is available on the blog and through the links below. We would also love you to get in touch and tell us what you think about the Furniture123 blog. If you have any questions about our products or services, or about an order you have already placed, please visit our contact us page. *Delivery within GB mainland is FREE on all orders, except to PA, IV and KW postcodes where there will be a small additional charge which will be advised prior to order processing. Please also note that Next Day Delivery can not be offered to these postcodes. Next Day Delivery is also subject to stock availability.